The aim of this exercise is to explore a variety of lighting effects and colours in artificial light. A raised view looking along a busy road to catch the headlights and tail lights of the traffic as streaks. 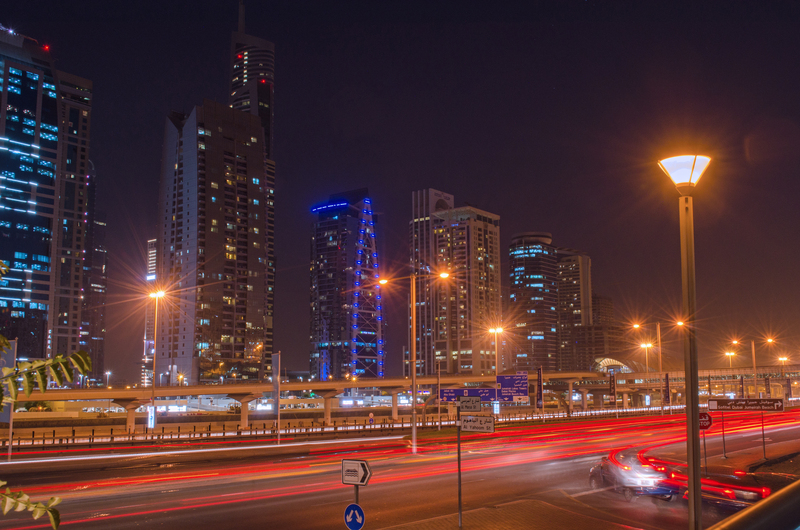 This is a photograph of The Address Hotel, Dubai Marina around one hour after sunset. I composed the photo so that the building is centrally positioned and the tilted view creates diagonal lines to lead the eye upwards. Using a tripod, a shutter-release cable and with the camera in bulb mode I took a few test shots. At f/8 and a two second exposure time the image was seriously under-exposed and the background sky was pitch black. I increased the ISO slightly to ISO 320 and experimented with longer shutter speeds via Bulb Mode, eventually taking the shot at 5-seconds. I experimented with various WB settings in-camera before deciding that tungsten worked best for the scene as it added some blue, which worked well for the sky. I was quite excited to note that the 5-second exposure time managed to capture some stars in the sky. However, it has also rendered the screen that was showing adverts, on the bottom right, totally white. The exterior of this café/restaurant caught my eye because of the brightly lit signage and the red/green complementary colour scheme. It was also one of the few on that stretch of road that didn’t have condensation on the windows because of the difference in temperature between indoor (cool AC) and outdoors (34c). I experimented with several compositions but decided that it worked better with the shop front filling the frame. I again used f/16 and ISO 320, with an exposure time of 3-seconds via Bulb Mode. This has captured the exterior of the restaurant quite clearly but caused the movement of the restaurant staff to be blurred that adds to the idea of hustle and bustle. The restaurant was in a busy area of town with lots of other bright lights nearby many of which can be seen reflected in the shop front, such as the fairy-lit palm trees. I can’t quite decide if I like this effect or not. Are the reflected lights distracting, or do they add to the idea of ‘busyness’ and energy? I think perhaps they would have worked okay across the top of the glass if the bottom of the glass were not already decorated with the shop logo. Both are probably too much. It also makes me wonder if a polarising filter on my lens would have helped at all? I chose a view of the interior of Marina Mall, Dubai for this image. The course notes advised that we did not use a tripod for this shot which provided quite a challenge. While the mall seemed bright enough with all the bright lights, the camera required a 1-second shutter speed at f/16 and ISO 100 making it impossible to get a sharp shot. I raised the ISO to 200 and then again to 320 and took this shot at ¼s exposure time, while bracing the camera against a ledge to steady it. There is a little bit of motion blur from the people moving around the mall which I like, however the overall image seems a little ‘noisy’, particularly when you zoom in. Tungsten WB seemed the best fit for this scene as the others created very strong colour casts. The exercise instructions suggested an elevated view over a road, such as a pedestrian overpass, for this task. There are numerous pedestrian bridges, which cross Dubai’s busy roads making the Metro system accessible, however they are enclosed to make them air-conditioned and comfortable for commuters. I decided to explore one of these bridges over Dubai’s Sheikh Zayed Road to see if shooting would work through the window glass. The glass appeared to be tinted and I took a few test shots to see if this impacted upon the image and noted it did add some blue. After considering this, I decided to work with this, as it would perhaps reinforce the idea of twilight/and or evening light. I experimented with various positions and set-ups before opting for the camera on a tripod, which was set to its lowest height. This was then placed on a ledge with the lens positioned to look along the road, but also avoiding the horizontal bars, which decorated the exterior of the bridge. I placed the lens as close as I could to the glass while allowing for a little bit of focusing room, then attached the shutter release cable. Then I waited for the sunset. As I was in a busy location I did attract some curious looks and also the attention of a member of Dubai Police, who, once he had established what I was doing, was happy to leave me to take photographs. Sunsets seem to happen quickly in this part of the world, which makes working with residual light a very short window of time. The sunset was due at 18:16pm and by 18:30pm the daylight was low enough to make the car trails appear very bright, although not low enough for the buildings to be lit, which could have detracted attention from the light trails. Using bulb mode, f/16 and ISO this photograph was taken with a 4.4s exposure time. The red and white light streaks on the highway below can be seen clearly while there are some white and red streaks can also be seen on the slightly elevated road on the left side. I was surprised to note that Daylight WB was the best fit for the low light in this shot. I experimented further with the RAW file in post-processing but found, somewhat ironically, that daylight WB made the scene look more like nighttime than the other WB presets. Thirty minutes later and all the daylight was gone. I took this shot further along the road (you can see the bridge I was standing on earlier on the right hand side of the frame) looking towards the road and the buildings of Jumeirah Lake Towers. I experimented with a few WB balance options in-camera before deciding that fluorescent WB was a good fit here. Even with a 7.1-second exposure using Bulb mode the image was under-exposed and I had to up the exposure post-processing considerably. With hindsight I wish I had experimented with even longer exposure times. This could have brightened the entire image as well as erase the glimpse of the car from the bottom right of the frame, leaving only it’s light trail. There is also some lens flare from the street lamp closest to the camera, which perhaps could have been avoided if I had been using a lens hood. I do like the starburst effect from the other streetlights, which I think are actually more dominant in the frame than the car light trails, and the overall contrasting colour palette of red and blue. This was a varied and interesting exercise that has reinforced the idea that there is not a magic; one-size fits all set up to meet the range of differently lit scenes that I encountered. Instead, it requires a lot of trial and error while tweaking the exposure settings to capture the shot. This exercise had also encouraged me to experiment with the Bulb Mode function in my camera that I had not done before. I found it a bit of ‘eureka’ moment when I realised why my attempts at nighttime photography before had not been successful. I experimented a little bit more with Bulb Mode as can be seen below. This entry was posted in 19b-Outdoors at night and tagged Dubai Marina, Night photography on September 25, 2013 by catherinefinniganphotography. This exercise involves looking at the different colours of tungsten and fluorescent lighting so that I am able to identify which light is which. However, Präkel (2007, p77) notes that photographers should not seek to over-correct the yellow quality of tungsten light in domestic scenes, as viewers tend to associate yellow warmth with domestic interiors. 1. The first part of this exercise requires a room lit brightly by tungsten lamps and then waiting till just after sunset. You then look out of the window into the diminishing light for one minute before turning to look at the room light. Note what colour the room light appears. Look again out of the window and think what colour does the daylight appear? I carried out this task and found that the tungsten lights in the room appeared very yellow, far more so that I recalled them to be. When I looked back outside the window the light looked to be blue. This helped illustrate the fact that our eyes have the ability to quickly adapt to light qualities. 2. The second part of the exercise asks that I measure the light levels in the tungsten lamp lit room. Will the camera at full aperture and the ISO set to 100, I took readings from various parts of the room. An area close to a lamp with a 40W tungsten bulb measure at a shutter speed of 1/10s. A plant in a corner read at 1.5s, as did a darker area leading to a hallway. This was too slow for handheld shooting and the resulting images were blurred. A bookshelf in a corner read at 1/4s and a vase of flowers near to the window measured at 1/8s. This illustrates two things, the spread of tungsten light across the room was uneven and varied enormously depending on location and also that the quality of tungsten lighting is much weaker than that of daylight, around 2900K for a 40W household light bulb compared with approximately 5500K for daylight. 3. Part three asks that I compose a photograph in which an interior lit by tungsten lamps and the exterior at dusk are visible. When the light levels inside and out are roughly equal, take three photographs adjusting the WB as follows: Auto, daylight and tungsten. Compare the results. I took these photograph to show both tungsten light and daylight in one image. The Auto WB shot has given the image an orange tone, more to the objects inside than the buildings in the background outside. The colours do not reflect the original scene. Daylight WB has given the interior a slight orange colour cast. However, the colours outside are a good match to those in the original scene. Tungsten WB has captured the colour of the cardigan well and helped to pick up the navy blue of the stripes. The rest of the scene however, has a strong blue colour cast, which looks artificial. It would seem that there is not one WB camera preset (on my camera) that can accurately balance a scene such as this, with light from differing sources and qualities. Perhaps this could be remedied to some degree by experimenting with a Custom WB setting? Fluorescent light appears white to the eye but can photograph as greenish or yellowy. Präkel (2007, p78) explains that the reasons for this is that fluorescent light does not produce a continuous spectrum of colours, instead, it is a mixture of colour spikes. The quality of light also varies between manufacturers, the age of the light and the cost and application of the light. Digital cameras usually have one or more WB setting to offset the cool shades of fluorescent by making them brighter and warmer. However, as the temperature of fluorescent lamps is so variable the fluorescent WB preset cannot be the ‘right’ balance all the time. 1. Find two different interiors lit by fluorescent lights. If possible, one should be lit by small CFL (compact fluorescent lights). Take two or three photographs in each location varying the WB from Auto to fluorescent. Compare the results. Auto WB has given the image a green colour cast while the fluorescent WB has compensated for the perceived coolness of fluorescent by adding‘warmth’ to the image. However, it has over-compensated and the results are very orange. This basement car park is lit with fluorescent strip lighting. The Auto WB image seems to contain a lot of blue with the green of the parking bays appearing very pale. The white car closest to the camera also appears bluish, as does the ceiling. The Fluorescent WB seems to have done a better jog at balancing the colours but it still not accurate, as there seems to be a slight pink colour cast to the ceiling. This has shown me how varied fluorescent lights can be and because of this it is difficult to predict how they may light a scene. Before this exercise I have tried to take photographs indoors under fluorescent lighting, with varying degrees of success in balancing colours. Now I understand a little more about how these lights differ from tungsten lights, I can appreciate why this would have been the case. Of course, unwelcome colour casts can usually be removed when editing however I think it is of interest to think of what feeling uncorrected light can evoke in an image, such as in Nightmare by Karl Fakhreddine, shown in Präkel (2007, p79). Sodium-vapor lamps, Warm-white fluorescent, white fluorescent, Cool-white fluorescent, Day white fluorescent, Daylight fluorescent, High temp. mercury-vapor. This entry was posted in 19a-Tungsten and fluorescent light on September 21, 2013 by catherinefinniganphotography.